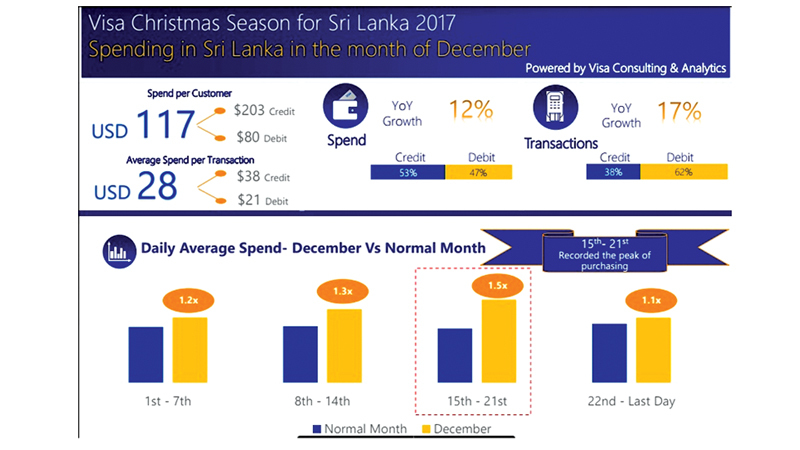 Visa has released spend data for the month of December 2017, indicating a spike in spending across categories in particular, across apparel, food & groceries and home improvement by Sri Lankan consumers during the holiday season. “This December we witnessed strong spends by Sri Lankan consumers across various categories. True to the spirit of the holiday season, spends were concentrated around travel, lodging, F&B, apparel and retail goods. 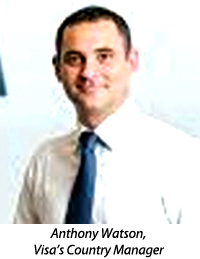 e-commerce transactions grew by 28% on a y-o-y basis in line with the growing preference for online shopping across Sri Lankan consumers,” said Anthony Watson, Visa’s Country Manager for Sri Lanka and Maldives. Total card spends during the month of December grew by 12% with credit cards accounting of 53% of the spends. In comparison to a normal month, spends grew 1.2X during December 2017, primarily led by strong growth in purchases of apparels & accessories, food & groceries and home improvement for face to face transactions. e-commerce spend growth were led by spends in Education & Government expenses, Professional services and Airline spends. December 2017 also witnessed firm growth in international spends by Sri Lankan consumers clocking a 10% y-o-y growth, indicating Sri Lankan consumer’s preference for international travel as well as shopping on international platforms. “These are exciting times for the payment industry in Sri Lanka. As financial services expand their portfolio of digital enabled payment gateways, we are happy to note that more and more Sri Lankans are choosing to pay with the card, helping them realize the true benefits of going digital”, says Watson. Visa is a global payments technology company that connects consumers, businesses, financial institutions, and governments in more than 200 countries and territories to fast, secure and reliable electronic payments.